juice’s story is becoming all too common in the world of breeding. 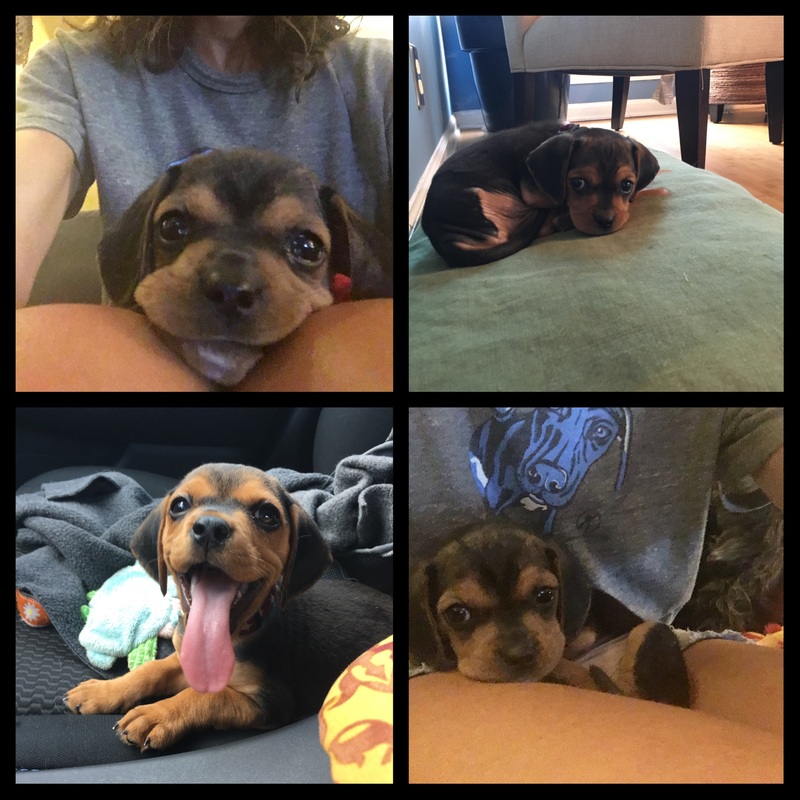 he was theoretically bred to be a designer dog (cavalier and beagle mix), worth money to his breeder, but because he was born with a defect was deemed “worthless”, taken from his mother way too young and dropped at a shelter. the offending defect was a rear leg that was not attached when he was born. enter the amazing snooty giggles rescue and juice’s real life began. the original plan was to nurture him and hope he attached to another dog and plan amputation surgery when he was at least 8 weeks old. when the leg became infected at 5 weeks old the plans went out the window and he underwent major surgery which he survived with flying colors because he is a superstar. in the middle of that story is where our journey with juice started and we took a bit of a windy road to where we are now. i’ll do my best to make a long story short and tell you that for quite a while we have been trying to find a dog that would bond to carly because she seemed to be in need of that. 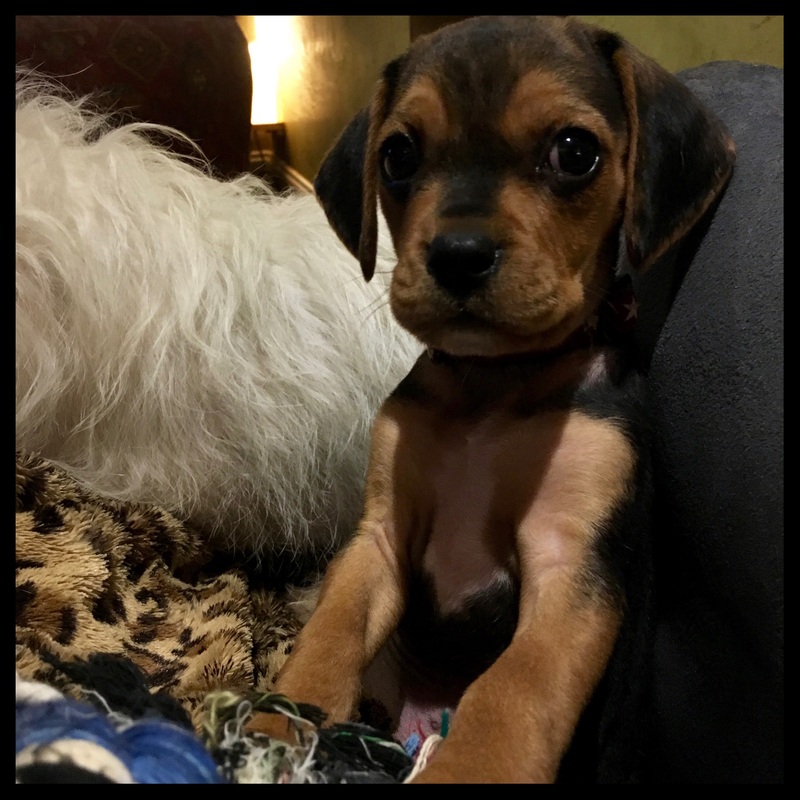 in talking with shawn from snooty giggles we had decided that a very young puppy that badly needed a bond would be the best route (odin and estelle were both theoretically adopted for this purpose and for various reasons did not complete the mission**). we weren’t interested in ripping a puppy early from a mother to fulfill this need so we were looking for a pretty specific situation to occur. we also aren’t generally in the habit of adopting adoptable puppies because…well we just aren’t - we tend to stick to “special needs” dogs. when juice came into the group it was seemingly a perfect match…he desperately needed to be nurtured and was technically special needs. i was so excited for carly on the way home with juice and i just couldn’t wait to introduce them… aaaaaaand carly could not have cared less. apparently i misread the whole situation: carly wanted to be loved and played with…she didn’t want to have to do any work. basically juice spent the night here and then went back to the rescue because he needed to have someone to bond with and that dog wasn’t here. i told you this was a long story and i’m not sure i’ve shortened it at all (which is why it’s taken me 3 weeks to write this) but i did break it up with some cute pictures to lessen the blow. the week following us “returning” juice is when he had surgery and we realized, even though he wasn’t a match for carly, we really wanted the little bugger back just because he’s awesome and so we brought him home…again. that was about 3 weeks ago, juice is now about 9 weeks old, and as i said before is an absolute superstar. he’s unphased by pretty much everything (meaning his 15 new brothers and sisters), he’s learning quickly how to get by with 3 legs, he’s getting stronger every day and he’s a force of life and love who seems to literally enjoy everyone here and they in turn enjoy him too. i’ve got a bunch of video to share of him but for now i’ll leave you with this one of he and carly because it tickles my heart. this doesn’t happen often but it’s happened…so there’s that. *technically he’s a foster to adopt so should he decide he isn’t happy here he would be adopted elsewhere…we’re hoping and assuming it won’t come to that. **i feel compelled to add that both estelle and odin have fulfilled their real purpose of being loving and adored members of our family.